ISLAMABAD: The joint opposition on Wednesday announced it won’t nominate members for standing committees if it was ‘robbed of its right’ to head the Public Accounts Committee (PAC). A meeting to this effect took place between Pakistan People’s Party (PPP) leader Khursheed Shah and Leader of the Opposition in National Assembly (NA) Shehbaz Sharif. The two agreed on a joint strategy to tackle the government’s bid to keep PAC under its domain and mutually agreed that the opposition parties won’t compromise on the issue. Last week, the federal government decided to appoint a PAC chairman from the treasury benches whereas traditionally, this post has been held by the opposition. Information Minister Fawad Chaudhry made it overtly clear that the Pakistan Muslim League-Nawaz (PML-N) couldn’t review audit objections raised during their tenure. “The opposition leader is awarded chairmanship of PAC under the Charter of Democracy signed between PML-N and PPP,” revealed Fawad. 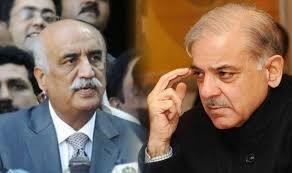 Shehbaz Sharif later claimed PAC chairmanship is predominantly the prerogative of the opposition. Responding to a question to whether he would be the chairman of PAC, Shehbaz Sharif replied that it is a custom that opposition leader enjoys PAC chairmanship.